Glaciers exist because accumulation exceeds ablation (melting) in a location. This accumulation zone after it thickens to more than 30 m begins to move. For a glacier to survive it must have a consistent and persistent accumulation zone. 1) Emergence of rock outcrops in accumulation zone (upper region) of the glacier. 2) Recession of the upper margins of the glacier around the accumulation zone. 3) Lack of consistent snowcover at the end of the summer in the accumulation zone of the glacier. Glaciers respond to climate in an attempt to achieve equilibrium. A glacier advances due to a climate cooling/snowfall increase that causes positive mass balance. A climate warming/snowfall decrease leads to negative mass balances and glacier retreat. To reestablish equilibrium a retreating glacier must lose enough of its highest ablating sections, usually at the lowest elevations, so that accumulating snows in the near the head of the glacier once again are equivalent to overall ablation, and an equilibrium balance is approached. If a glacier cannot retreat to a point where equilibrium is established, it is in disequilibrium with the climate system. A glacier that is in disequilibrium with present climate will melt away with a continuation of this climate. We often focus on terminus change of a glacier which tells us how the glacier is currently responding to recent climate. 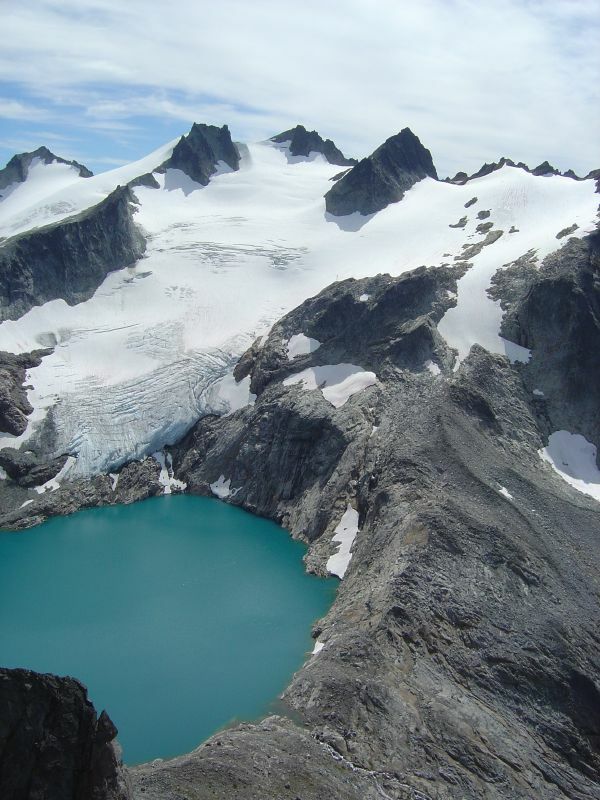 A glacier can retreat rapidly and still survive if it has an accumulation zone. Thus, to forecast survival we need to focus on the accumulation zone, not just the terminus. If the accumulation zone no longer retains accumulation consistently it will begin to thin. A glacier needs 50-70% of its surface area to be snowcovered event at the end of the summer to be healthy. A thinning accumulation zone is evident when the margins of the glacier in this accumulation zone-upper potion of the glacier recede. Also new outcrops of rock maybe exposed in the accumulation zone due to thinning. 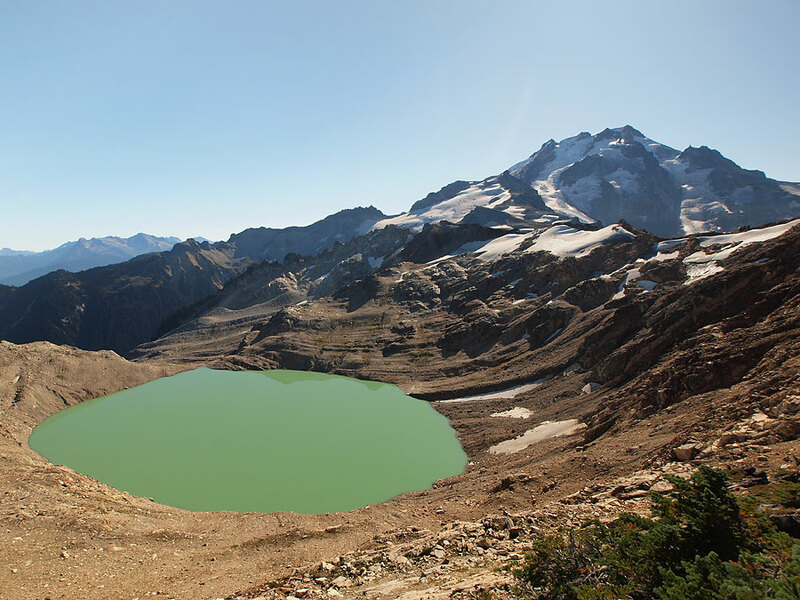 This has been observed both in the North Cascades and on Swiss glaciers. Below are examples of glaciers that have disappeared, will disappear and that can retreat to a new position of equilibrium with current climate. This is not to say that further warming will not eliminate many of the the glaciers that have an accumulation zone today. Sometimes adjacent glaciers can have differing forecasts based on their varied response to recent climate. It is unusual for an entire mountain range to be inhospitable to glaciers today. Recent forecasts of the rapid loss of all glaciers in Glacier National Park or the Nepal Himalaya are exaggerated. In each case the glaciers are retreating notably, but some of the glaciers still have persistent accumulation zones. In the Himalaya the most photographed glacier is probably the Khumbu Glacier on the south side of Mount Everest. 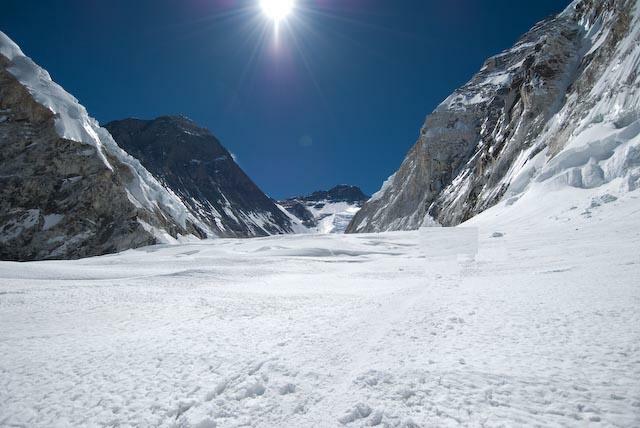 Above the famed Khumbu Icefall there is a persistent accumulation zone, indicating it can retreat to a new point of equilibrium with current climate. 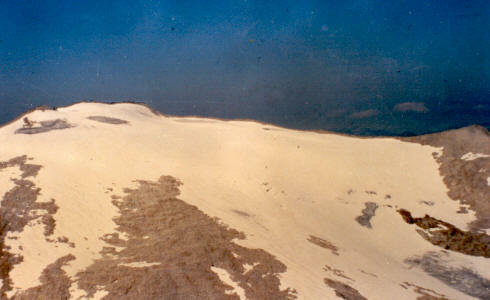 Above is Foss Glacier in 1985, still covering a large area of the east slope of Mount Hinman. 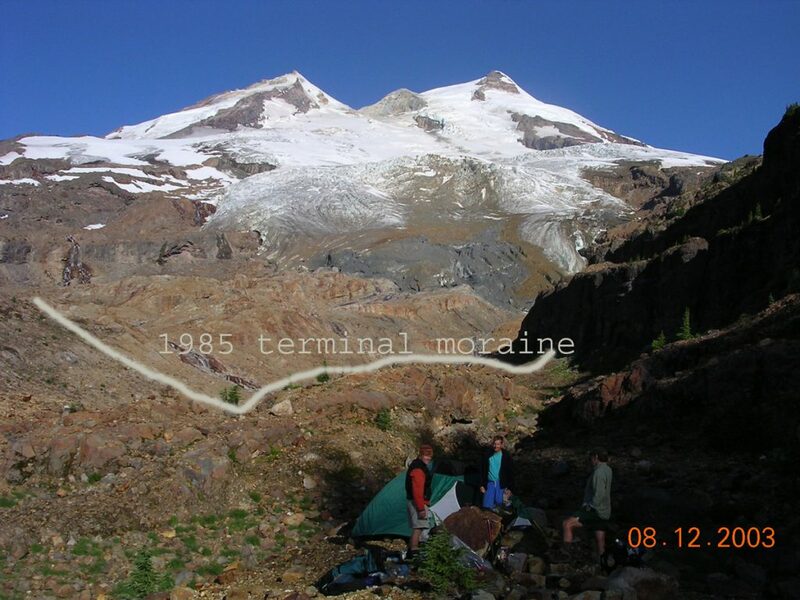 Above is Lynch Glacier in 1996 the accumulation zone on the upper right is still all glacier ice. By 2005 this area had developed a rock island in the upper right, below. 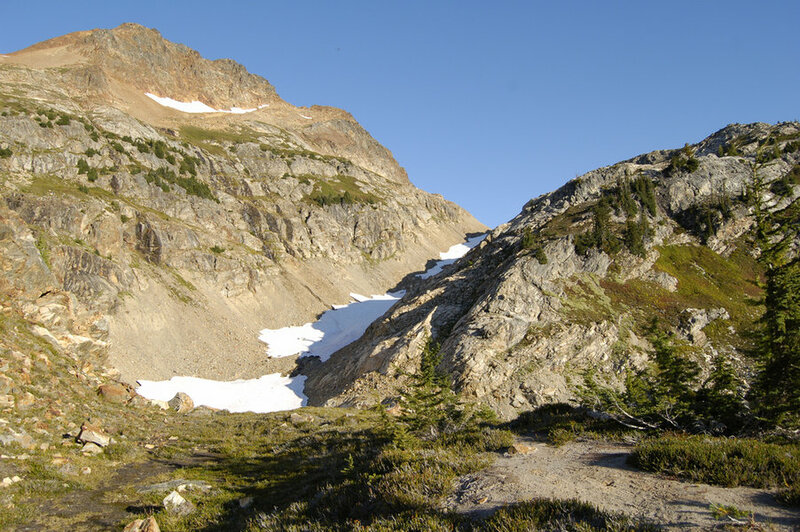 Above is Foss Glacier in early August 2006, almost no snowpack remained. There is recession of the glacier even at its upper margins. Lyall Glacier above in the 1955 map on the right and at left disappeared during the 1990's. In 1985, 1987, 1992, 1993 and 1994 the glacier did not retain any snowpack from the previous winter. 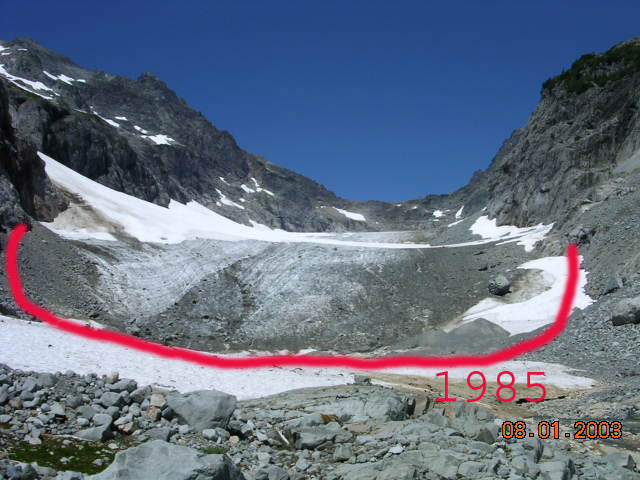 Milk Lake Glacier above in 1988. has no remaining accumulation zone in the area next to the newly forming lake. By 1998 the lake had fully developed and the peripheral remnant ice melted as seen below in 2008, no ice left just a nice round alpine lake. Spider Glacier at left did not maintain a consistent accumulation zone and disappeared by 2005. In 1987, 1992, 1993, 1994, 1998, 2003 and 2004 the glacier lost all of the accumulated snow from the previous winter. 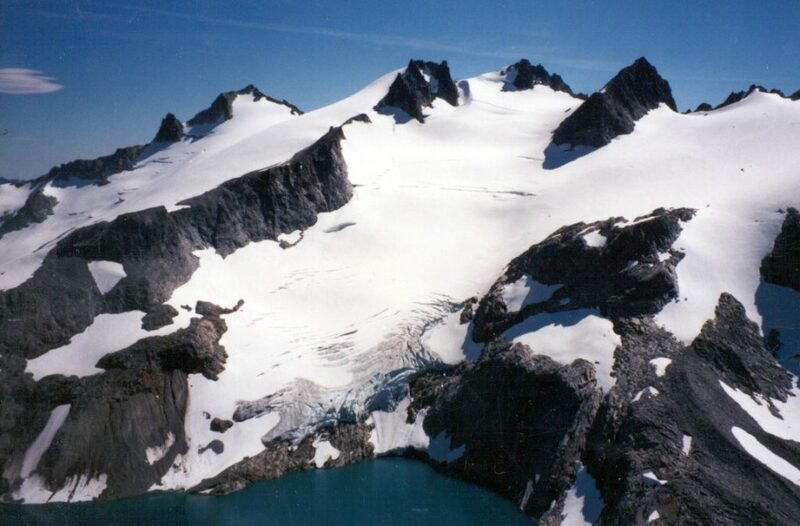 The Lower Curtis Glacier on Mount Shuksan advanced from 1950-1975 and has retreated 184 meters from 1987-2004. A longitudinal profile up the middle of the glacier indicates that it thinned meters from 1908-1984 and 6 m from 1984-2002 . The thinning has been as large in the accumulation zone as at the terminus, indicating no point to which this glacier can retreat and achieve equilibrium with the present climate. The Columbia Glacier near Monte Cristo has retreated 135 meters from 1987-2004. A longitudinal profile up the middle of the glacier indicates that it thinned meters 57 m from 1911-1984 and 8 m from 1984 to 2002 . 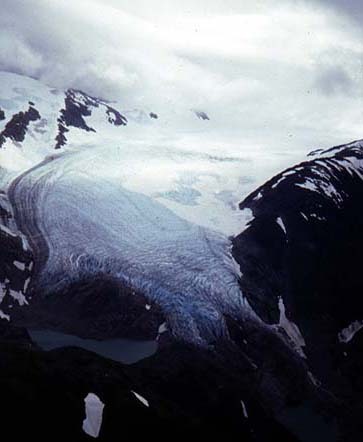 The thinning has been largest in the accumulation zone since 1984, indicating no point to which this glacier can retreat and achieve equilibrium with the present climate. 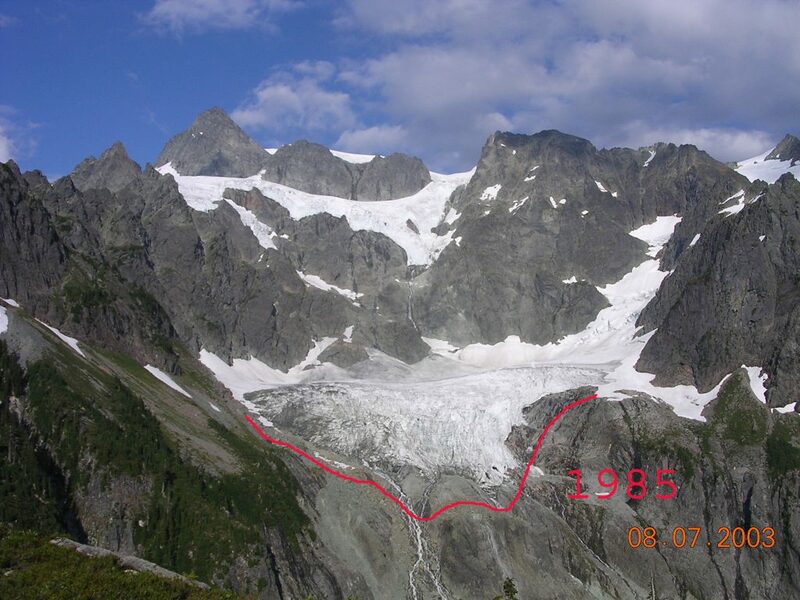 Boulder Glacier (right) advanced from 1958-1980 and then began retreating slowly until 1992, when retreat became rapid. Boulder Glacier has retreated 500 m since 1987, yet even in the years with the lowest retained snowpack there is still an accumulation zone at the top of the glacier. Thus, continued retreat can lead to an equilibrium position. Lemon Creek Glacier, Alaska has retreated since 1 km since 1957, but is still 5.4 km long. The glacier has a typically well defined accumulation zone. 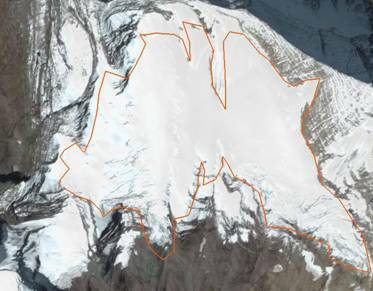 The glacier has also thinned by an average of over 25m. Mass balance measurements have noted just 3 of the last 50 years in which the glacier has not retained any snowpack. This indicates a consistent accumulation zone with current climate and that the glacier can retreat to a new point of equilibrium. At far left is Fremont Glacier, Wind River Range Wyoming. The orange line is the 1966 glacier margin. 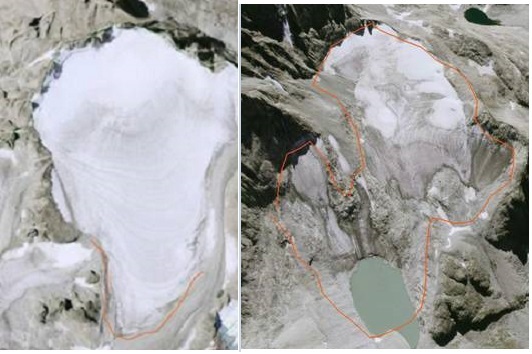 The 2005 satellite image illustrates a glacier that is retreating slowly, has a good accumulation zone and will survive. The right hand glacier is Minor Glacier in the same range. This glacier has retreated considerably even at the head of the glacier and as the image shows, little if any accumulation zone will remain at the end of the melt season. 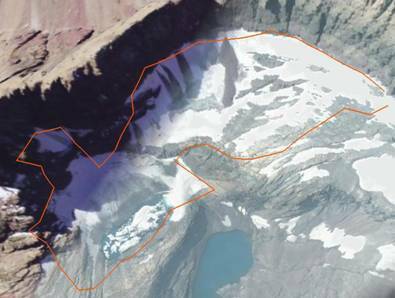 this glacier consistently loses all snowpack and will disappear. 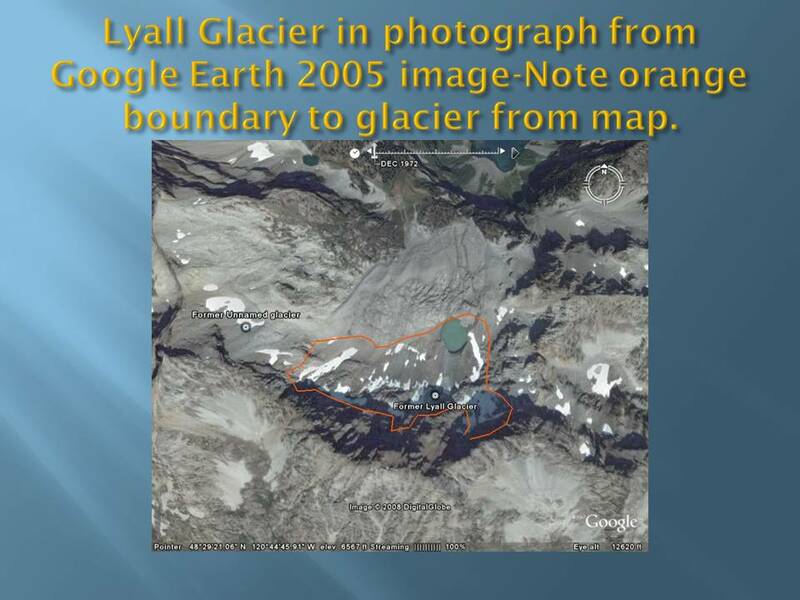 Harrison Glacier, Glacier National Park, the glacier margin in 2005 and orange line showing the 1966 margin map overlay on this SPOT satellite image. No evident change in the accumulation zone indicates an equilibrium response to current climate is possible. Marginal change since 1966 has been minor. This glacier will not melt away in the next 20 years. At left is Shepherd Glacier in Glacier National Park, Montana. 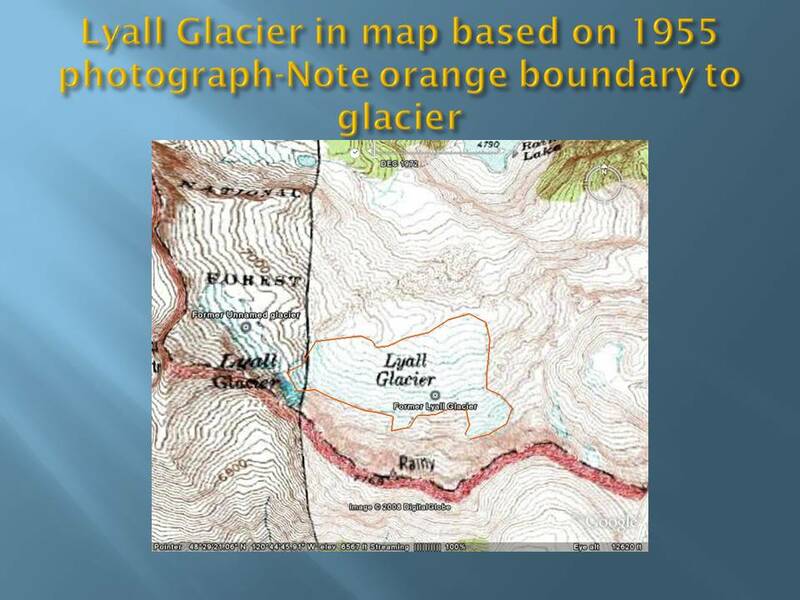 The orange outline is the 1966 glacier margin. Retreat has been substantial including at the head of the glacier. This glacier cannot survive long. Khumbu Glacier, Mount Everest has an area above the famed icefall called the Wester Cwm, this is an accumulation zone that does not lose its retained accumulation. This glacier is retreating at the terminus, but the accumulation zone is healthy.